SmartATI was honored with an award for fast growth and economic innovation in a slow economy. 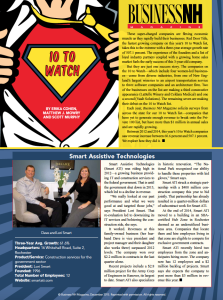 The company was awarded and placed on the Top 10 Companies to Watch list by the BusinessNH Magazine. SmartATI was attributed for consistent fast growth and a continued entrepreneurial spirit. When many companies saw slow growth or even a down turn, SmartATI continued to excel alongside NH’s leading top businesses. We are proud of our continued success and give credit to our hardworking staff for their dedication, professionalism, and the skill they bring to the table to make up such a wonderful team!